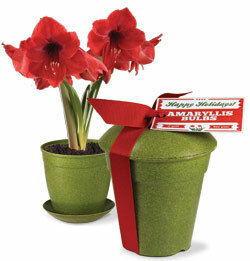 Description: This easy-to-grow Amaryllis gift will deliver many ooohhh’s and aaahhh’s this holiday! Simply water and watch while the bulbs shoot up and open flowers in an extravagant display. Our Red Lion amaryllis is well-known for producing breathtaking scarlet red blooms up to 8” across! A single bulb is pre-planted in our renewable and sustainable rice hull flower pot with saucer. Your bulb gift will arrive tied with a red ribbon, and a “Happy Holidays!” gift tag. Expect blooms in 6-8 weeks.